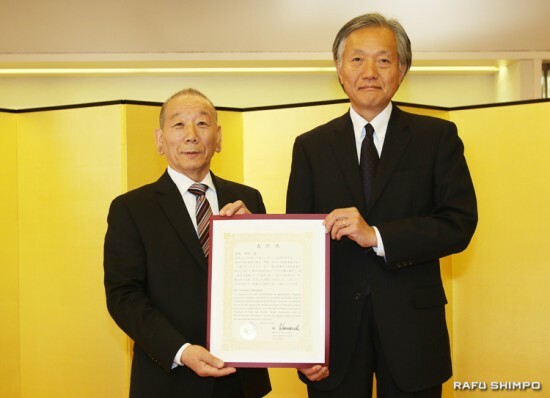 Toshiaki Toyoshima (left) receives his commendation from Consul General Harry Horinouchi. 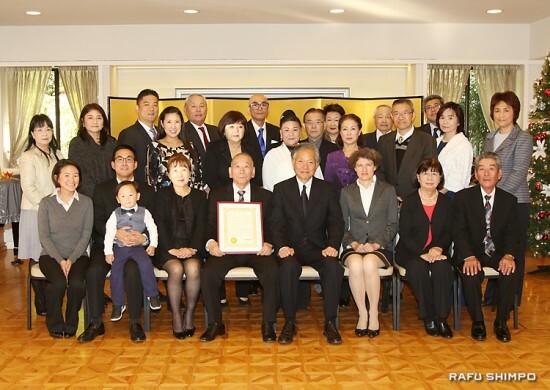 The Consulate General of Japan in Los Angeles conferred the Commendation of the Consul General on Toshiaki Toyoshima, owner of Sushi Gen, on Dec. 14. Born in Aomori Prefecture, Toyoshima left for Tokyo in 1962 to begin his career as a sushi chef and came to the U.S. in 1973. In 1980 he opened Sushi Gen in Little Tokyo, which has been a popular restaurant ever since. For the past 35 years he has provided fresh and delicious sushi similar to that served in Japan, and introduced genuine Japanese food to non-Japanese people. Toshiaki Toyoshima gives his acceptance speech. Toyoshima was instrumental in the establishment of the Aomori Kenjinkai and served as its fourth president, contributing greatly to the development of the Japanese American community. Since 2007, he has been the first president of the L.A. Nebutabayashi Hozonkai and in February of this year, he assumed the post of “tourism ambassador” for Aomori City, placing much emphasis on the promotion of Japanese culture. He is involved in many events, doing demonstrations of Aomori’s haneto and hayashi dances. This year alone, he oversaw the participation of the illuminated Nebuta float in both the Nisei Week Parade and the Hollywood Christmas Parade. He continually contributes to the popularization of Japanese traditional culture. 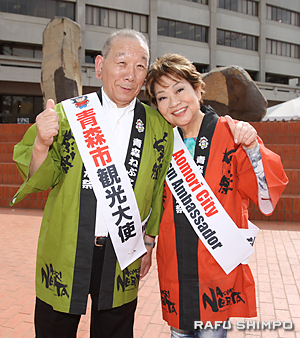 Toshiaki Toyoshima and Southern California Aomori Kenjinkai President Kaori Nara were named “tourism ambassadors” for Aomori City. The ceremony at Consul General Harry Horinouchi’s official residence in Hancock Park was attended by approximately 20 guests, including Toyoshima’s wife and friends. 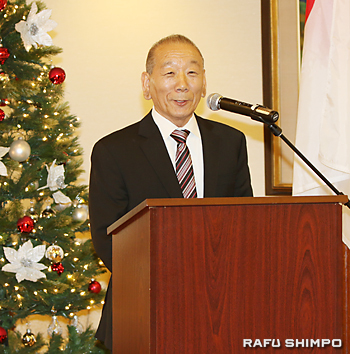 Horinouchi’s remarks provided an overview of Toyoshima’s struggles in running a popular sushi restaurant over the years in Los Angeles and his role in the spread of Japanese culture in Southern California, for which the consul general extended his sincerest appreciation. After the conferment of the certificate, Toyoshima expressed his gratitude to all those who had supported him over the years and stated that he did not ever intend to retire. Congratulatory remarks were given by Joji Kusayanagi, president of International Marine Products, and Kazuhiko Shimizu of Sushi Gen, both of whom thanked Toyoshima for his great diligence. The toast was given by Tsuyoshi Tanooka, former president of Market Specialty, who congratulated Toyoshima on his achievement. The approximately 40-minute ceremony was followed by a reception. 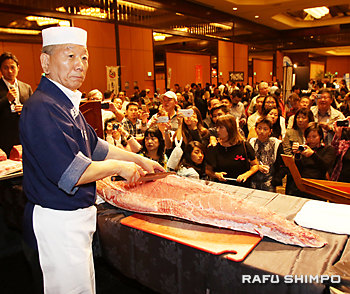 Toshiaki Toyoshima slices a large maguro at a Japanese Restaurant Association event. Toshiaki Toyoshima and Consul General Harry Horinouchi pose for a group photo with the honoree’s family and friends.